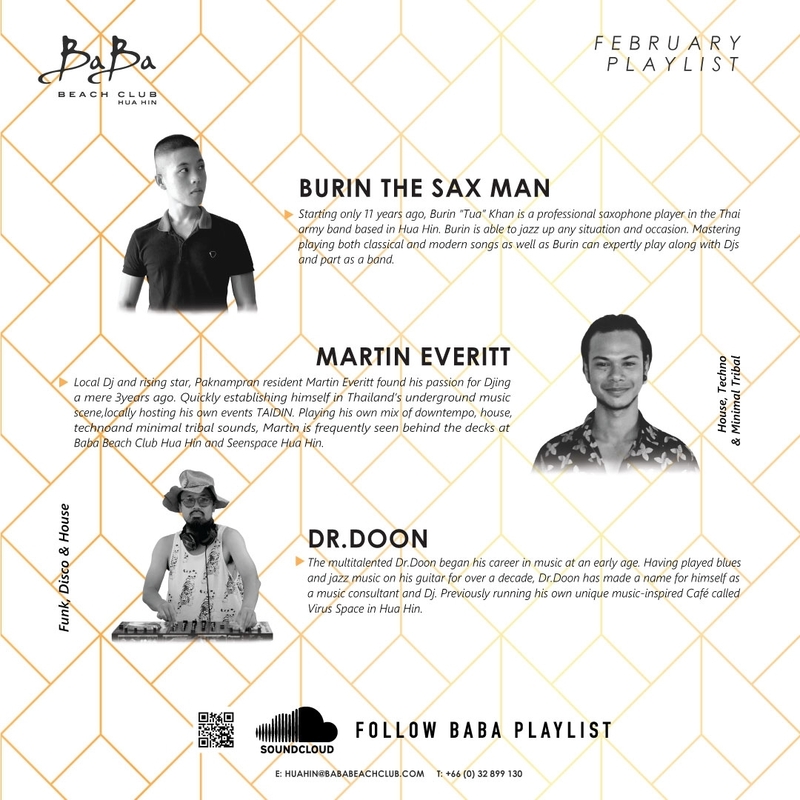 Our February Playlist at Baba Beach Club Hua Hin is here so sit back, relax and enjoy the Baba Vibe with live performances by our resident acoustics band, The Tiny Band, and our dynamic saxophonist Burin The Sax Man, alongside local talents Dj Bonita Everitt, Dj Dr.Doon and DJ Martin Everitt. We are finishing off the month hosting our monthly BEACH SATURDAY with a guest visit by the talented French Dj Roulio Aittouares for a weekend escape with Disco & House beats. 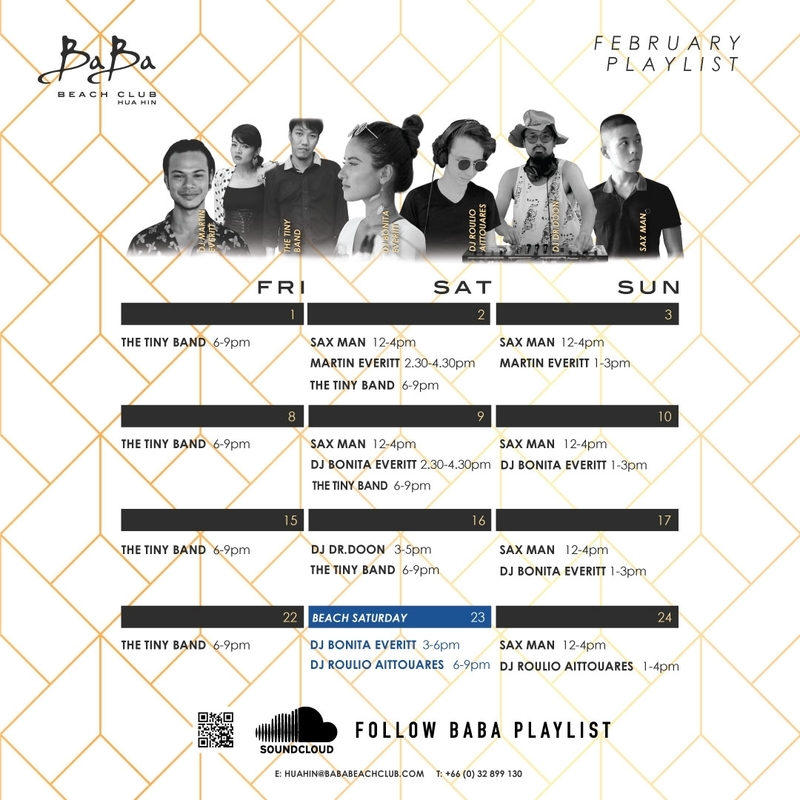 Make sure to join us at Baba Beach Club Hua Hin for a day at the beach filled with great music, delicious food, cool cocktails, and more. Quickly becoming a regular on Thailand’s underground music scene, the Parisian-born Roulio developed a passion for music at a young age. As an avid vinyl records collector, eternal track digger and DJ, Roulio effortlessly mix an eclectic music selection ranging between minimal, house, techno, tribal, and disco beats. Having developed his unique style through his travels from Europe to Asia and beyond. An established face in Paris underground music scene, Roulio is seen playing at famed local venues such as Mustache, Sorry I’m Gay, T-Rex, Glow, and many more. Local Dj and rising star, Paknampran resident Martin Everitt found his passion for Djing a mere 3years ago. Quickly establishing himself in Thailand’s underground music scene, locally hosting his own events TAIDIN. Playing his own mix of downtempo, house, techno and minimal tribal sounds, Martin is frequently seen behind the decks at Baba Beach Club Hua Hin and Seenspace Hua Hin. The multitalented Dr.Doon began his career in music at an early age. Having played blues and jazz music on his guitar for over a decade, Dr.Doon has made a name for himself as a music consultant and Dj. Previously running his own unique music-inspired Café called Virus Space in Hua Hin. Thai native Bonita Everitt is a passionate Dj new to the underground music scene, having first discovered her love for Techno and House once moving back to Thailand. Later influenced by living in Abu Dhabi and experiencing the arabic culture, she was introduced to tribal beats creating her own unique mixture of sounds. 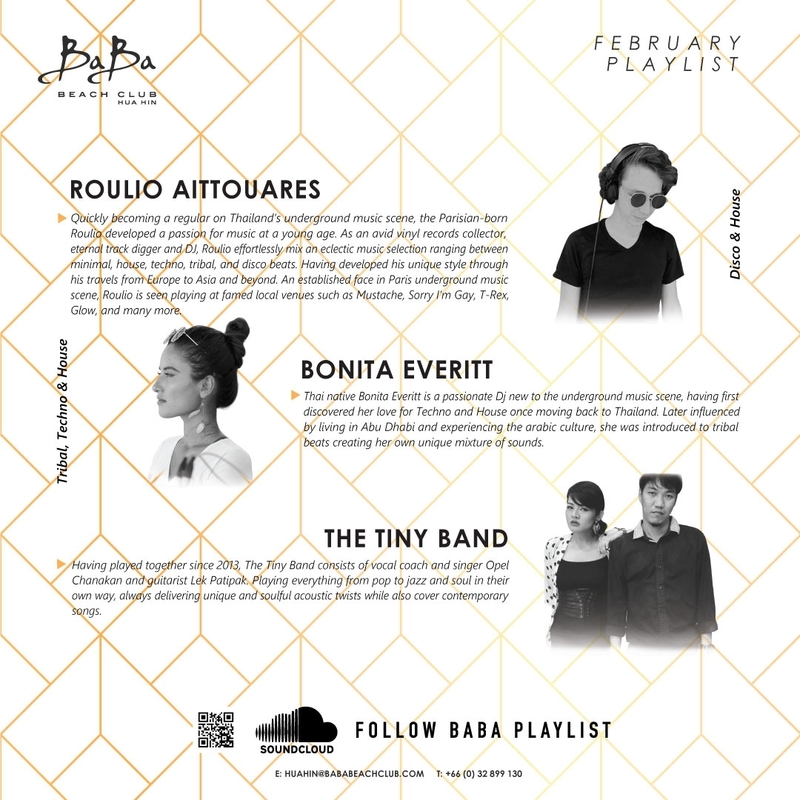 Currently based in Pak Nam Pran, Bonita has been seen playing at famed local venues in Thailand’s capital as well as locally arranging her own events such as Wilburland, or sunset sets at Baba Beach Club and Seenspace Hua Hin.